Kartell K-Vit Genoa Modern Freestanding Bath - Only £649.99! In stock now for just £649.99 including VAT! Hurry while stocks last! The Genoa Modern Freestanding Bath from Kartell K-Vit is one of our most popular thanks to its sublime looks, superb quality and great value. The soft rounded corners make this a lovely looking piece which would look perfect in any style of bathroom. Providing the perfect bathing space for one or two people, this beautifully crafted, ergonomically designed bath has sleek slopes and smooth surfaces which give you the perfect soak. The seamless acrylic remains warm to the touch, and its extra thick sides ensure fantastic heat retention, making this an ideal sanctuary for you to relax and unwind in. Part of the new expanded range of freestanding baths from VIP Bathrooms, the Genoa by K-Vit / Kartell is the perfect partner for any style of bathroom. No matter whether yours is a striking modern look or a vintage, traditional bathroom, the Genoa is sure to fit right in. Available now for fast delivery, at a highly competitive price - don't delay, order today! Combining the latest designs with modern practicality, this modern range also offers truly excellent value for money - this really is an ideal combination of style and substance. With their stunning curved edges, sleek and elegant lines, bold shapes and eye-catchingly smooth acrylic finish, these baths will set your bathroom apart from the crowd. 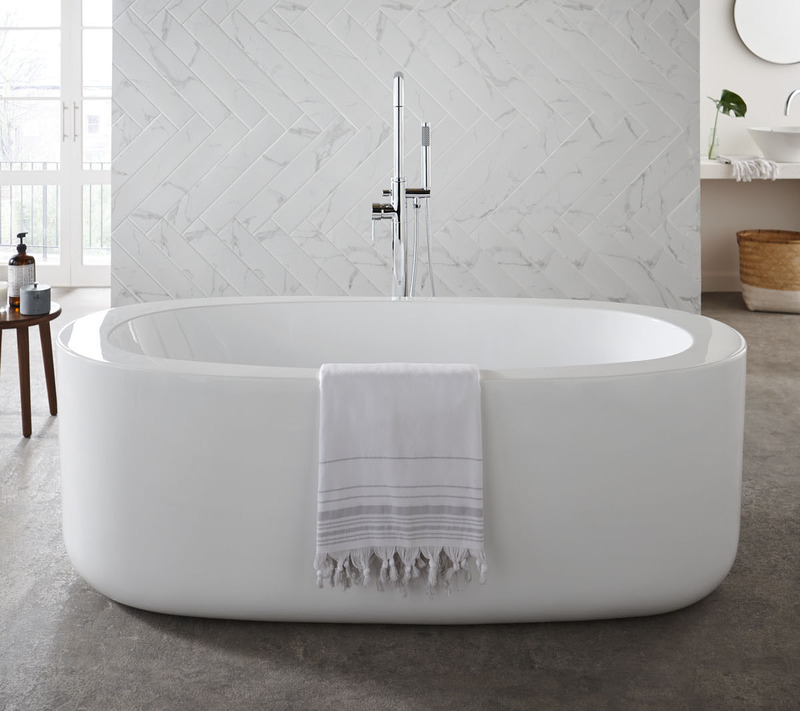 Built with extra-high sides for maximum water capacity, and manufactured to the highest standards to ensure lasting durability, these modern freestanding baths are the ideal choice for your home. Crafted from two high quality acrylic panels, each acrylic skin is given extra support with the resistant properties of resin bonded glass fibres on both the inner and outer linings. For the added retention of heat, each panel is lined with special thermal sheeting, ensuring total heat efficiency. Finally, a tight bond between each skin and the bath base is formed via the solidity of a strengthened polyester cast. All of this ensures your water stays as hot as possible, allowing you as much time as possible to forget your worries and unwind.